Pioneers in the industry, we offer kalre lightning conductor tester from India. 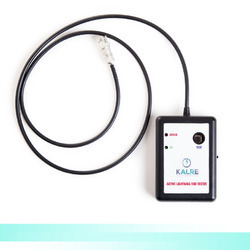 With KALRE Lightning Tester, you are able to determine if there is a short circuit or a fault in the ion generator immediately by simply screwing in the special plug at the end of the cable to the ESE rod and pressing the button on the testing device. We are able to make the cable on the testing device according to the customer’s requirements. Looking for “Kalre Active Lightning Rod”?